In its international approach, Japan has in recent years adopted the basic philosophy of “Value Oriented Diplomacy,” based on universal values such as freedom, democracy, rule of law, and the market economy. It has expanded the circle of freedom to the Indo-Pacific region in an effort to form a rich and stable area based on the “Arc of Freedom and Prosperity” concept. Undoubtedly, when the entirety of the Indo-Pacific region is viewed in geopolitical terms, the Indian Ocean region that lies within it functions as an axis for international politics, economics, and security. 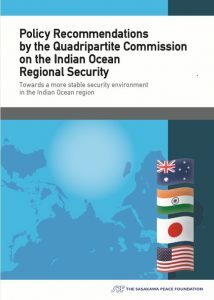 Recognizing that stabilizing the security environment in the Indian Ocean region is extremely important for peace, prosperity, and the sustainable development of international society, the Sasakawa Peace Foundation in Japan invited the Vivekananda Foundation of India, the National Security College of the Australia National University, and Sasakawa USA to form the ‘Quadripartite Commission on Indian Ocean Regional Security,’ which convened for international conferences in February 2017 and February 2018. The participant organizations reflected independent ‘second track’ viewpoints from four nations with significant stakes and involvement in the Indian Ocean region and with shared democratic values. This policy recommendation was created by the representatives of the organizations from four different nations, based on the results of the commission’s research, and reflects their personal position. The content of this policy recommendation does not indicate the views of the respective nations or specific organizations to which the members of the commission belong. Papers for the project have been published as an Appendix.